Herniated disc removal is one of the most common operations performed at the University of Florida. Herniated disc, commonly known as a slipped disc, is a condition in which the central part of the intervertebral disc protrudes into the spinal canal. This typically occurs due to a tear in the tough fibrous annular ring that surrounds a soft inner core, resulting in herniation of the softer material. Aging is the most common cause, however trauma can also cause disc herniations. Most commonly this occurs in the lowermost part of the spine, however these can occur in the neck. This protrusion usually occurs to one side of the spinal canal, at the point where a nerve root leaves the canal. Impingement on the nerve causes pain, numbness, and weakness in the part of the skin and muscle that are supplied by that particular nerve root. Cervical discs cause pain in the neck, shoulders, and arms. This is called radiculopathy. Pain may radiate down the arm into the hand in the specific distribution of the compressed nerve root. If a cervical disc compresses the spinal cord, there may significant problems with walking, spasticity, and bowel-bladder incontinence. This is called myelopathy. The spine is examined with the patient laying down and standing. 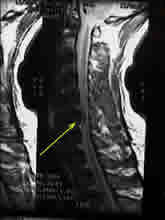 Due to muscle spasm, a loss of normal spinal curvature may be noted. Radicular pain (inflammation of a spinal nerve) may increase when pressure is applied to the affected spinal level. Individual muscle groups are tested for strength to determine any signs of weakness. The entire body is tested with fine touch and light pins to determine any subtle loss of sensation. Abnormal reflexes at the elbows, hands, knees or ankles may reveal the location of the disc herniation. MR (magnetic resonance) imaging provide the best way to view the anatomy and soft tissues around the spine. Herniated discs are easily seen and can be examined for surgical options. If the patient is unable to get an MRI, i.e. the patient has a pacemaker, a CT scan with myelography is an acceptable imaging technique. The initial treatment for a herniated cervical disc is usually conservative and involves non-steroidal anti-inflammatory medication (ibuprofen, Aleve, Motrin) and rest. Approximately 80% of herniated discs can be managed conservatively. Most physicians will prescribe physical therapy to help relieve the pain. Therapists employ traction, ultrasound, and electrical muscle stimulation to relax the muscles that are in spasm and secondarily inflamed from the compressed spinal nerve. An epidural steroid injection may be performed utilizing a spinal needle under x-ray guidance to direct the medication to the exact level of the disc herniation. This is performed either by the neurosurgeon or a pain specialist. If there are signs of myelopathy or when conservative treatments fail then surgery is necessary. The most common operation for a herniated cervical disc is called an anterior cervical discectomy and fusion (ACDF). This procedure involves an incision in the neck, which exposes the front of the spine. 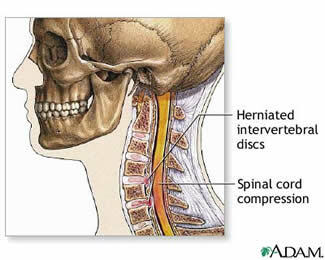 The disc is removed relieving any pressure on the spinal cord and nerve roots. A bone graft, either for a bone bank or from the patient’s own hip, is then placed in the space with a metal plate bridging the area. Multiple level ACDFs can be performed, depending on the number of discs involved. A modification of this procedure involves actually removing the vertebral body in addition to the disc, followed by placement of a bone graft and metal plate. This is called a corpectomy and fusion. A posterior cervical discectomy may be performed as well. During this operation the bone is removed from the back of the spine to expose the compressed nerve root. The disc is then removed allowing space for the root to pass. Recently, artificial discs have been introduced in the treatment of cervical disc disease. 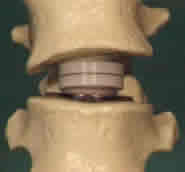 A prosthetic disc can be placed into the disc space without having to place a bone graft. This has the advantage of maintaining normal mobility of the neck and hopefully preventing premature disc disease at other levels of the spine.